Aileen Ibardaloza Cassinetto reviews Blood Orange for #allpinayeverything, October 2018.
lengthen to the frayed edges of day. igniting Tita Pacita’s rooms at dusk. and none but stag beetles heard. A review by Elizabeth Nichols in Pirene's Fountain: A Journal of Poetry. Volume 7, Issue 15. Fall/Winter 2014. Each sense in engaged in the rediscovery of San Juan. The reader hears the children, feels the heat of hand rhymes, and smells the burning leaves. Memories are alive again and given agency with present-tense verbs: knowing, feeling, and entering in-the-moment. The Return to San Juan is a perfect opening to the collection because it signals that, in Torres' poetry, something vital has come back to life and demands to be known. on the morning of my departure. rivers of a heart pinched open. The poems about her mother and father pin open the hearts of the past, and discover inner lives. The shattering of crystal and the peering of a microscope become pathways into the thoughts and emotions of people in certain moment in time. These two poems, in fact, demonstrate what meaningful, powerful poetry does best: cast a heightened, sharpened lens on life, lending new contrast, color and understanding to everything, even the infinitesimal. and night, between dog and wolf. The french expression entre chien et loup literally translates to between dog and wolf. The expression itself is multi-layered, and Torres' paints each layer of its meaning delicately. Between day and night, that vulnerable time between light and dark, a gray space emerges. In that gray uncertainty, it is impossible to tell a dog from a wolf; to recognize safety from danger. The meaning in life that Torres' speakers search for is shadowed in the between the bright whites of magnolias in the sun, and the blacks of ink and night. In Blood Orange, the reader comes closer to the grays of life: feels the uncertainty and makes it known. In the vibrant rediscovery of life and self through poetry, there is a recognition that human existence itself is entre chien et loup. Torres' collection assures the reader that with new-found understanding, “you're found, come home,” (65). North American Review, Spring 2014. Review by Vince Gotera, editor of NAR. A review by Vince Gotera, editor of the North American Review, Spring 2014.
a small dark star, aureole of a nursing breast." -Diego Baez, reviewing Blood Orange for H_NGM_N Books. Read the full review here. impatient to turn the corner, to catch the first train. (“Paris Aubade”) Read the full review here. -Laurie Saurborn Young for AMRI (American Microreviews and Interviews). May 1, 2014. 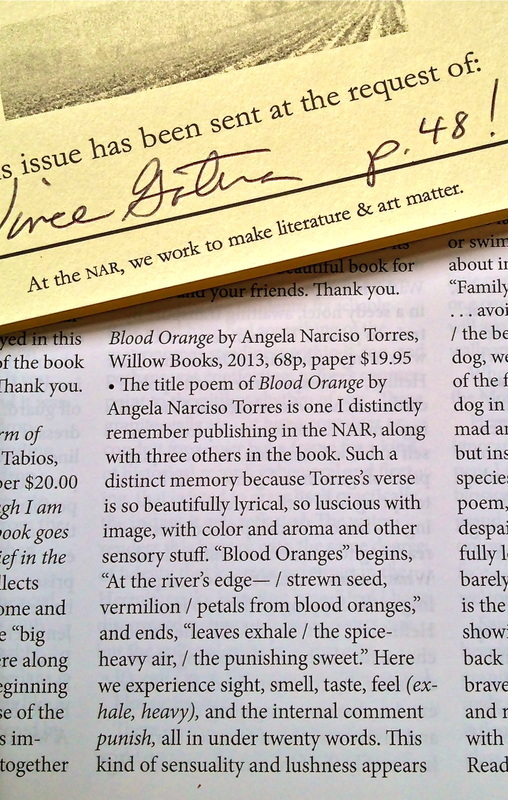 "Filipina-American poet Angela Narciso Torres launched her first book Blood Orange (Willow Books 2013) late last September in Illinois, serving notice that Philippine poetry in English is not only alive and well in another tropic or hemisphere, but also beating with the heart of deep kinship. There is not a line here that doesn’t celebrate family, however indirectly at times, the primary unit of society that for the most part is front and center of her poetry." -Juaniyo Arcellana, The Philippine Star, Dec. 30, 2013. Read the full review here. a piano scale spiraling from a small window. from the sputter of onions in a blackened pot. (“To Return to San Juan”)" --Dilruba Ahmed, writing for the Poetry Foundation's Harriett blog (November 2013). Read the full review here. Angela Narciso Torres's poems call to mind the best work of the late great Seamus Heaney. Like Heaney, Torres digs deep into the fertile details of ordinary life and shows how profoundly defined we are by the people and places we come from. Her power as a poet comes from her ability to associate sounds, scents and colors with the core issues we all must face as we move through life. Throughout the book she is a watchful, listening, ultimately clairvoyant presence. And this posture enables her to connect the sound of a piano through a window, "boy smells" of talc and metal, the sight of her mother expertly putting on her nylons, and the pungent odors of the sea with entire destinies. In each poem we are reminded of the paradoxical nature of life: how everyone and everything is at once permanent and fleeting. We are also reminded of how the personal and historical past is always in our blood, and how even in our absence, the future will somehow contain us. I know a book of poetry is good if it keeps beckoning to me. This is that kind of book. I keep returning, re-reading and being rewarded for the effort. A review by Donna Miscolta, author of "When the De la Cruz Family Danced." …starting/ at the beginning doesn’t help me to remember. death. Torres’s language is clean and fluid, the better to make her images shimmer.